You can see this casino hotel for 10 minutes before you arrive on Hwy 10. Half hour west of Palm Springs.very nice, large development ( and cheap gas at the band gas station beside the resort ). 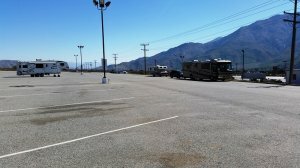 The large paved, flat, well lit RV parking lot ( lot G ) , behind the casino is accessed past the west side of the casino parade. Only about 100 yards behind the parking lot entrance to the casino.Don't need to register first but if you sign up to be a Winners Club member you get $ 10 free gambling credit of $ 10 discount off the buffet. There are about10 different places to eat in the casino. Some fast food ( 24 hours ), Thai noodle , Mexican etc all in the casino. Many ,many slots .poker tables etc. there's even a club room with a DJ Thurs, Fri and Sat. Monday night football ( event ) in the large Mexican theme restaurant. Very busy place on the Veterans Day 2013.